ChequeSystem Cheque Printing & Management Software - Print, Manage and Track your Cheque. Frequently Asked Questions. Q: We have different bank accounts for different purpose. Is it possible to have multiple cheque books in the ChequeSystem? A: Yes. In ChequeSystem, you can set different cheque books to manage different accounts. Q: I can't find my bank cheque's layout, can you help to set it in? A: You can send us a copy of your cheques. Our support team will help you to create the cheque layout. You can send us email support@evinco-software.com or fax to +852 3020-9588. Q: What types of printer ChequeSystem supports? A: ChequeSystem supports Laser Printer, InkJet Printer and Dot-Matrix Printer. As different types have different printing alignment, before printing your cheque, you may need to set the "Printer Settings" under "Settings" to fit your printer. Q: I can print on my cheque, but the text on the right-most does not print out. Please help. A: Maybe the text is too close to the right edge of the given paper size. Some printer may set a safety margin, which those text inside the margin will not print out. You may try to "cheat" the printer by increasing the width of the cheque layout. 1. Click menu "Management > Cheque Layout List" and double-click to edit your cheque layout. Q: Does ChequeSystem support batch printing? A: Yes. Batch printing is one of the advance feature in ChequeSystem. You can prepare all the cheques and print them all in a batch. You can find the functions under "Tools" menu. Q: Will the existing data keep after I register the software? A: Yes. All the existing data/settings will be kept after registration. Q: Is there any backup/restore features? A: The backup/restore features are provided in the registered version. It allows to backup all the documents and related data, reports, and all the settings into a zip format. 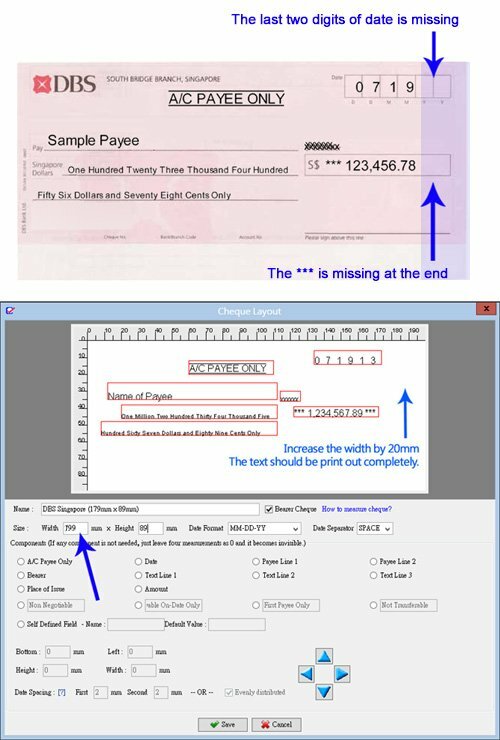 Q: How many cheque templates (layouts) in the software? A: In ChequeSystem, there are over 200 cheque layouts from 137 banks. There is an editor which allow you to prepare the layout to fit your bank cheque. You may also scan your cheque and email the copy to us. We can prepare the layout for you. Follows are the bank list of the cheque layouts. Akhand Aanand Co-op Bank Ltd.
Shamil Bank of Bahrain B.S.C. Q: There is a void function in the cheque. If the cheque is void, will it count in the report? A: No, it will not get into calculation if the cheque is void. Q: The date format of my bank cheque is MM DD YYYY. How can I change the date format? A: Different bank cheques may have different date formats, you can change the date format in the cheque layout. Please click menu "Management > Cheque Layout List". You can choose your bank cheque layout and double click to edit it. In the edit windows, you can change the date format. Q: Is there any forum I can post my question about the software? Q: How to transfer the software to new machine? A: Please follows the steps below. In menu "Tools > Backup", save your data into a zipped file. In menu "Tools > Restore", locate your zipped file and start restoration. 5. You may need to perform registration again. It can be done via menu "Help > Register".